New Zealand won by 8 runs. That's about it from us after a thrilling game (the match report is already up) - it's a quick turnaround as England are gearing up for their crucial game against South Africa in Mumbai (see below). We'll be back about 13:25 GMT with all the build-up - there's commentary on Test Match Special, and in-game highlights here on the website. Grab some lunch and see you in a little while. Dan Armstrong: Outstanding work again by the New Zealand bowlers and well marshaled by Williamson as always. More from Australia captain Steve Smith: "We've a lot more to do. We need to find success in the middle order because there's a lot of power in the back end if we can keep wickets in hand. We have to find a way to do it and hopefully we can do for the next game." New Zealand captain Kane Williamson: "We're fortunate to play on two wickets that were very similar. It was nice to get a score on the board that, on this surface, was tough to chase. "It's important that you read the conditions and select accordingly. Today we thought we had to be different again and I'm pleased with the way the boys stepped up. "It's important we gel well. We look at the task at hand and perform as best we can." Australia captain Steve Smith: "I thought around 150 was about par. Obviously their spinners bowled extremely well again and we didn't respond well. You can't lose wickets in clumps like that, we couldn't get any partnerships together. "We didn't apply ourselves enough. We should have knocked the ball around a bit more rather than going for the big shots. But these things happen and we have to move on." It's a double celebration for New Zealand as their White Ferns have beaten Ireland by 93 runs in the women's tournament. Captain Suzie Bates (82 from 60 balls) helped NZ post 177-3 - and Ireland could only manage 84-5 from their 20 overs, captain Isobel Joyce top scoring with 28. 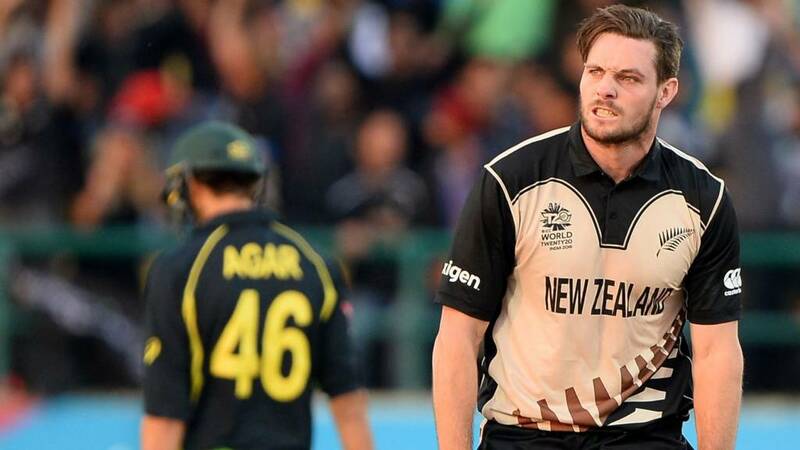 New Zealand's Mitchell McClenaghan: "It's nice to perform like that but it's as a collective. The spinners were fantastic bringing us back into the game, the guys really stood up. "It's nice to show some teams we can play in these conditions. Well take confidence from this but there are still two more games, we have got to win to get through. The Aussies never give up, full credit to them. I'm sure well see them later in the tournament." Paul Howley: That's how you do death bowling - well played NZ! Mitchell McClenaghan wins the Man of the Match award for his 3-17 from three overs. In which case, he probably pips Santner and Marsh to the less-heralded Mitch of the Match award. "It's New Zealand's day. They've played the conditions well here and combined as a unit, exceptionally well led by Kane Williamson." Vicky Ledbury: How am I supposed to do any work when it's this close?! So, New Zealand top Group 2 with two wins from two, while Pakistan have one from one - and Australia join India and Bangladesh in losing their first group game. "For the second match in a row the opposition of New Zealand thought they were chasing a comfortable score, but that team in the beige move to two wins from two. Two big victories at that." That all got a bit frantic there, hope you kept up even if our maths may not have been up to scratch. With 19 needed from the last over it went wicket, 1, 6, 1, wicket, 2. A great last over from Corey Anderson who finishes with 2-29 from four, but bowling plaudits also to McClenaghan (3-17 from three), Santner (2-30 from four) and Sodhi (1-14 from four).